If you haven’t heard about our new Lifecycle Services tools designed to help manage your entire Microsoft Dynamics AX application lifecycle, there are plenty of reasons to start learning more about them. A listing of the tools that are available can be found on TechNet (http://technet.microsoft.com/en-us/library/dn268616.aspx) and there are also a series of videos that show some examples of how the tools are used which can be found on our Lifecyle Services Engineering blog. 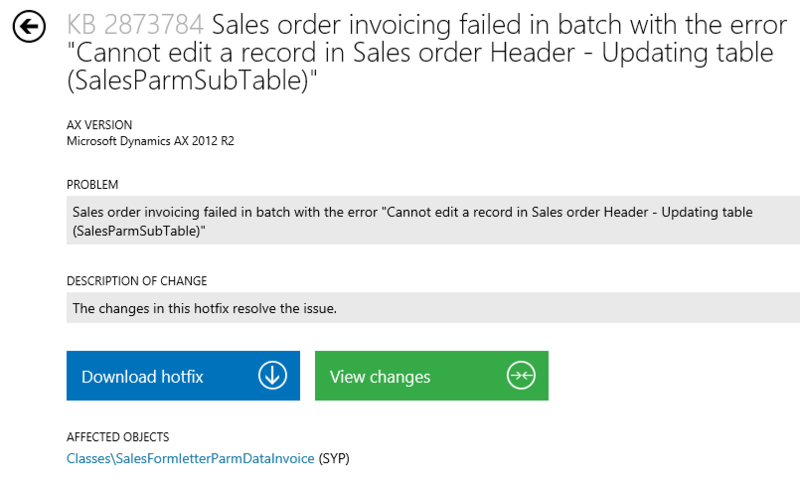 One of the most important and most exciting features within Lifecycle Services is the Issue Search service which provides the ability to download any hotfix released for any release of Microsoft Dynamics AX 2012 and get some high level information on what objects changed with that hotfix. If you know the KB article already for a fix, the search can instantly take you to a page to download the hotfix and get information about the contents of the hotfix. There are many other search options as well if you want to search for fixes in a particular area, keyword, release, etc. It is incredibly easy for any customer or partner that can login to CustomerSource or PartnerSource to be able to quickly get setup to look for and download hotfixes using the Issue Search tool within Lifecycle Services also known as LCS. If you have never used LCS before, just follow these quick and easy steps to get you started using Issue Search today! You will need to know the Windows Live ID that is linked to your CustomerSource or PartnerSource login. That same Live ID will be used to login to Lifecycle Services. In your browser, navigate to https://lcs.dynamics.com and choose to the Customer/Partner login option, and if you are already signed in to your linked Live ID you will be taken directly into LCS or you will be asked to Sign In at this time. If it is the first time you are logging in, you will be presented with a Legal Agreement that you must read through to the bottom and accept before entering the site. Once you accept the agreement you will come in to your LCS home page. If you already have a project created, press the All projects button to go into a list of the already created projects. Then pick one of the projects listed to get into the Project home page. Otherwise, click the New project button and give the project a name and description and choose whichever type of project you feel is most appropriate. Visit the Project home page TechNet information for a description of the different project types. Fill out the other information on the New project form and choose the Create project button. This will create the project and take you into the Project home page. On the project home page, look for the icon titled Issue Search (icon is a magnifying glass) and click on the icon to open the Issue Search tool. If you know the KB article number for the hotfix, type it in and click the Magnifying glass button to search. 7. Click on the title of the item in the list and you will be taken to the page which allows the download of the hotfix and additional information about the fix. 8. Clicking on the Download hotfix button will take you directly to the page to allow you to download the fix. Clicking the View changes button will take you to a window where you can inspect the code changes directly related to this hotfix. The only supported method for using hotfixes provided by Microsoft is to install the official hotfix package which can be downloaded. Microsoft DOES NOT recommend making code changes in your development environment based on the information shown in the View changes window. The information displayed does not highlight any changes that may have been already made by a prior or future hotfix which touch the same method or objects. As mentioned, you also can use keywords, areas of the product, or other options to search for Resolved or In Progess hotfixes. Using quotations to group words is suggested when doing a search if searching for a single phrase. Once the search is complete, you can easily click on one of the Item types or versions at the top to restrict the search even further. Information appearing in the Issue Search is updated very frequently. You are also able to select an issue that has an Open issue type and track its progress using a Watch List feature for issues that are currently under investigation all the way through to the resolution of the issue.